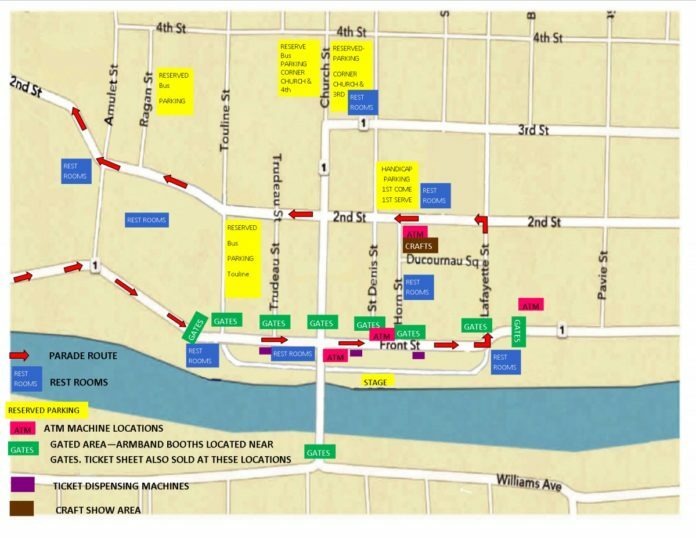 The Natchitoches Christmas Festival Committee and City of Natchitoches would like to remind festival goers of the following street closures and safety precautions for the 92nd Annual Natchitoches Christmas Festival Saturday, Dec. 1. At 10 a.m., no public parking will be allowed in the first block of Williams Avenue to East Second Street. This area includes the following streets between Williams Avenue and East Second Street: St. Maurice Lane, Adelaide Street, Sirod Street, Whitfield Drive, St. Clair Avenue, Stephens Avenue, and Henry Avenue. At 11 a.m., Second Street from Touline Street to University Parkway will close to vehicular traffic. At noon, University Parkway from Jefferson Street to Second Street will close for parade line up. All eastbound traffic on University Parkway will be stopped at Boyd Street, and all westbound traffic on Mill Street will be stopped at Airport Road. In addition, the Pine Street/Keyser Avenue Bridge will close at noon to all vehicular traffic, and all parade route barricades from University Parkway north to Lafayette Street will go up in preparation for the parade. The parade will begin at 1 p.m. at the corner of University Parkway and Jefferson Street. The parade will move along Jefferson Street to Front Street turning on Lafayette Street and continuing down Second Street to University Parkway. At the conclusion of the parade and when foot traffic allows, Jefferson Street and Second Street from Amulet Street south to University Parkway will reopen for vehicular traffic. The Pine Street/Keyser Avenue Bridge and University Parkway between Boyd and Mill Street will reopen as well. At 5 p.m., barricades will be placed on Williams Avenue north of Henry Avenue to St. Maurice Laneand at the intersections of East Second Street with Stephens Avenue, St. Clair Avenue, Whitfield Drive, Sirod Street and Adelaide Street. The fireworks show will begin at 6 p.m. over Cane River Lake. At the conclusion of the fireworks show and once the all clear has been given by the Fire Department, the Church Street Bridge will reopen to pedestrians and all streets outside of the gated festival area will reopen to vehicular traffic. For more information or the latest updates on the Natchitoches Christmas Festival, visit www.NatchitochesChristmas.com.